We all want to teach our kids to do good, and volunteering can be a great way to get them involved and show them how to give back to the community. Here are a few ways that even preschoolers can volunteer. When you’re at the grocery story, grab specific items you can donate to your local food shelf. Or go knock on your friends’ doors and ask for donations (maybe let them know you’re coming first so they’re prepared). As school kicks into gear, everyone is buying school supplies. However, this is a necessary expense not all families can afford. Also, when children come without the necessary supplies, that expense then falls on the teachers. Help provide school supplies by filling a back pack and donating to a nonprofit. A Precious Child has a program that may work for your family, otherwise contact your local school or local nonprofits to see if there is a need. Help provide necessaties for people as they get back up on their feet. Toiletry bags are a simple, tangible way to reach out. Portland Rescue Mission has a great list of what to put in these bags. Also, I suggest contacting your local shelter or social service agency to see if this is a need. Often times it is suggested to keep bags like this in our car to hand out, but this can often remove dignity from the person we are wanting to help. Working with a social service agency can help avoid this dilemma. In our culture nowadays it is rare to see our neighbors, and our sense of community had simply changed. Reach out to your neighbors and bring them some baked goods. Or if you know of someone in your church that has a hard time getting out and about, bring them some cookies. They may be thankful for the company. Along these lines, you could even look at volunteering with Meals on Wheels. There are so many benefits to visiting a nursing home with your children. Children need to learn to respect and care for elders in there life. And did you know that being around children helps stave off loneliness in the elderly, and prevents ageism. Senior Advisor has more information on the benefits of children visiting nursing homes. Most nursing homes have events for the elderly. See if there is a way you and your children could come visit or volunteer, even better is if you become regular visitors. Did you know that you can deliver Meals on Wheels as a family? Bring encouragement and community to an elderly neighbor by bringing them a meal. I saw this idea on Instagram with Read To Me Activities, and it is awesome for those living where it gets cold (ahem, Minnesota). 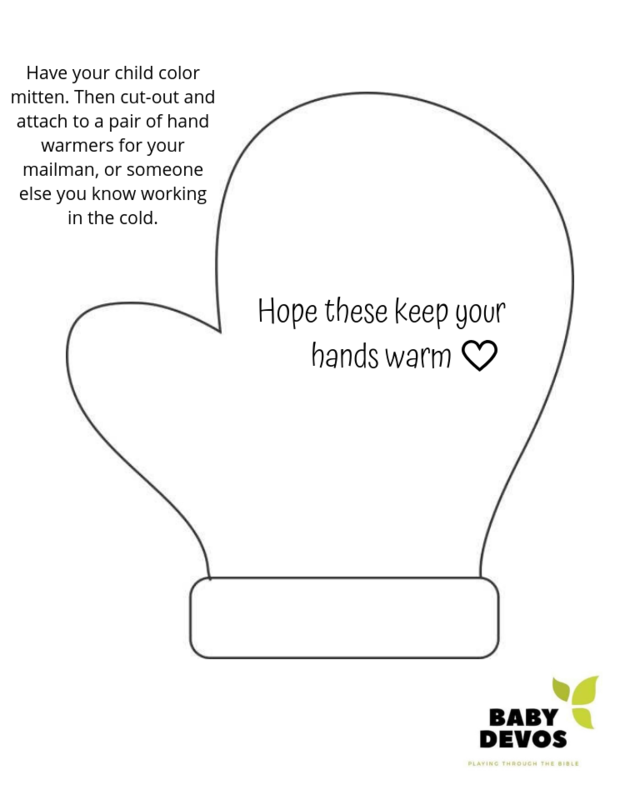 Say thank you to your mail man, garbage men, or other community helpers braving the cold by gifting them a pair of hothands. I’ve included a printable card template to make it easy: Hothands “Thank You” Note. Simply print the card. Let your child color it. Cut it out, attach it to a pair of hothands, and make your mailman’s life a little better. Has your toddler potty-trained? Load up all of your left-over diapers and donate them to your local diaper bank. Talk with your child about sharing the diapers they no longer need. I love the World Vision program that gives livestock to families. This gift provides a means for families to provide for themselves and increase their income. Allow preschooler to pick an animal to donate (i.e. a chicken). Help them ask friends and neighbors to donate money. See how many chickens you can buy together. Is there a wishing fountain in your local mall? You know, the fountains where little ones can throw a penny and make a wish? What preschooler doesn’t love the wishing fountain? Instead of using all the pennies to make a wish, encourage your child to leave one for a friend who may want to make a wish. It really is the little things. Cool and Dope is a volunteer organization started by kids to provide opportunities for kids to give back. Anyone as young as 2 years-old can volunteer with their organization. Subscribe to keep up-to-date on current projects. Have you ever volunteered with your littles? What did you do? Comment below! ❤Good Friday❤ Today is Good Friday, when we observe Christ's death on the cross. . ..... While we were reading the story, Vale made note: "Jesus had an 'owie.'" "Yeah, he did have an 'owie.'" I replied. Vale paused. "Did he want a bandaid?" Her observation stopped me. "I think he probably did." . ..... Her question was so simple, holding all the innocence of childhood. However, it made me reflect on something deeper: Jesus was human. The God of the cosmos put on flesh. He lived among us. Walked among us. He became one of us, so that he could become the sacrifice of humanity. . ..... "And Jesus cried out again with a loud voice, and yielded up His spirit. "(Matthew 27:50). And creation sighed, because it was finished. The weight of sin that barred humanity from relation with its Father had been lifted. "The veil of the temple was torn in two from top to bottom; and the earth quaked, and the rocks were split, and the graves were opened." (Matthew 27:51-52). But the story wasn't over. . ..... "Porque de tal manera amó Dios al mundo, que ha dado a su Hijo unigénito, para que todo aquel que en él cree, no se pierda, mas tenga vida eterna." Juan 3:16 . ..... P es para Pascua Christ did not just die to atone for sins. He died to be resurrected, and bring us with him. Into new life. Eternal life. Life more abundant. . ..... On this Good Friday, let us grieve for the weight of our sin. The destruction it causes. The death. But let us have hope that this is not the end. Sunday is coming. ❤Resurrection Rolls!❤ Who else loves these tasty treats? 🙋‍♀️ They are so simple, but create such a great illustration of the Resurrection. . ..... What you need: 🥐Store bought crescent rolls (you know the scary kind you have to unwrap and pop without notice 😖😂) 🍡And Marshmallows . .... Just wrap the Marshmallow "Jesus" in the crescent "tomb". Bake. And guess what! The tomb is empty. JESUS IS ALIVE! you can catch a tutorial up in my stories👆. . ..... ❤Have you made these yet? They seem to be pretty trendy. This was our first time and it was a blast. ❤"For God so loved the world..."❤ Today we explored the Arrest and Crucifixion of Jesus. We looked at this all together, because at this age I want to focus more on the Why, as opposed to the What happened (I'll talk more about this on Friday). . ..... We listened to the @jesusisbetterpodcast while we did some resist painting. Alicia does an amazing job of explaining and contextualizing the Bible for little ones and this story is no exception. . ..... For our resist painting, we did some fizzy art. My one regret is not seeing @thepreschoolworkshop post about their resist painting first! Next time we will use washi tape (swipe to see what I mean). You can get all the paint details up in my stories👆. . ..... ❤Have you tried resist painting? What are your tips? "And he took bread, gave thanks and broke it, and gave it to them, saying, 'This is my body given for you; do this in remembrance of me.' In the same way, after the supper he took the cup, saying, 'This cup is the new covenant in my blood, which is poured out for you. "-Luke 22:19-20 . ..... In Luke's account, Jesus is at the Passover seder when Jesus takes the bread and the cup. He gives us this sacrament to remind us that just as the lamb was slaughtered in the Exodus to atone for the first born. So Jesus was THE Lamb that atoned for the world. . ...... Over here we looked at the @jesus_storybook_bible and explained the sacrament to the girls. Jesus was going to die for the whole world. He gave us this meal to remind us of his death and the gift he has given us. I recited the passage from Luke. Then we took communion. . . Have you talked about communion with your littles yet? ❤Jesus Washes His Disciples Feet❤ This week we will start journeying through the moments leading up to Jesus' death on the cross. If you're following along on our Lent reading plan, you probably noticed I took a little more time during the Last Supper. I did that . ..... 1) because that's how they did it in our Storybook Bible 😂 . ..... 2) because there is so much rich symbolism behind the events of the Last Supper. In the Seder we find the "why" behind the "what" happened during the cruxifiction. We see that Jesus laid down his status, his authority, and ultimately his life for us. We see in the eucharist, that he is the ultimate atonement. No other sacrifice would be needed to make us right. Christ and his death was the ultimate sacrifice, and we are made whole simply in the believing and partaking of his grace. . .... Today we talked about Jesus washing his disciples feet. We talked about how feet are smelly (something Vale is learning and finds hilarious!) We talked about how Jesus decided to do the gross job of washing everyone's feet. He didn't have to, but he did it because he loved his friends. We also talked about how are hearts are sometimes like smelly feet. Like when we disobey, or get angry and yell (yup, mamas sometimes have stinky hearts too.) But Jesus didn't just come to clean stinky feet, he cam to wash stinky hearts, and make us clean. .... While we talked, I washed Vale's feet, and we used the Jesus Storybook Bible as a reference. We did all this while Naomi slept-in. 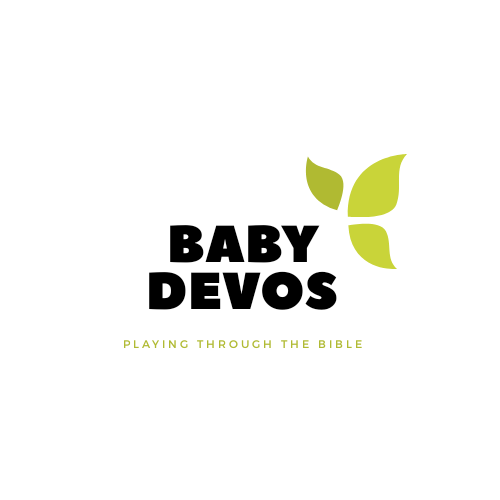 However, as soon as Naomi woke up, Vale was eager to wash her baby sister feet, and tell Naomi about how Jesus came to wash our feet and our hearts. 😍(Swipe to see.) ..... Friends, what does Jesus need to clean from our hearts today? Anger? Hurt? Ungratefulness? Let's let Jesus wash it away, so we can in turn wash the feet of others (especially those little people he's entrusted us with).